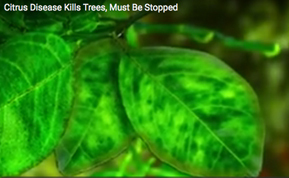 Huanglongbing or citrus greening disease is a plant disease that kills citrus trees has been found in California. The disease, called Huanglongbing or citrus greening disease, isn’t harmful to humans, but it is fatal for citrus trees and has no cure. The disease is spread by a pest called the Asian citrus psyllid as it feeds on citrus tree leaves. Until researchers find a solution, California homeowners who enjoy growing fresh citrus fruit in their yards, and California farmers tending to $2.5 billion worth of citrus fruit trees must work together to protect their trees. Learn more about how to detect the pest and disease and protect California’s beloved citrus heritage. On July 25, 2017, the California Department of Food and Agriculture (CDFA) confirmed a residential citrus tree in Riverside tested positive for Huanglongbing or (HLB), a deadly and incurable citrus plant disease. HLB is transmitted by the invasive insect Asian citrus psyllid, which is known to be in Riverside County. Local and state authorities acted quickly to remove the infected tree to prevent spread of the disease. Representatives from the Riverside County Ag Commissioner Office, CDFA, California Citrus Mutual, UC Riverside, and City of Riverside will be providing updates, information, and resources at a community information session on Thursday, August 17, 2017 at the Arlington Library from 6 – 8 p.m.